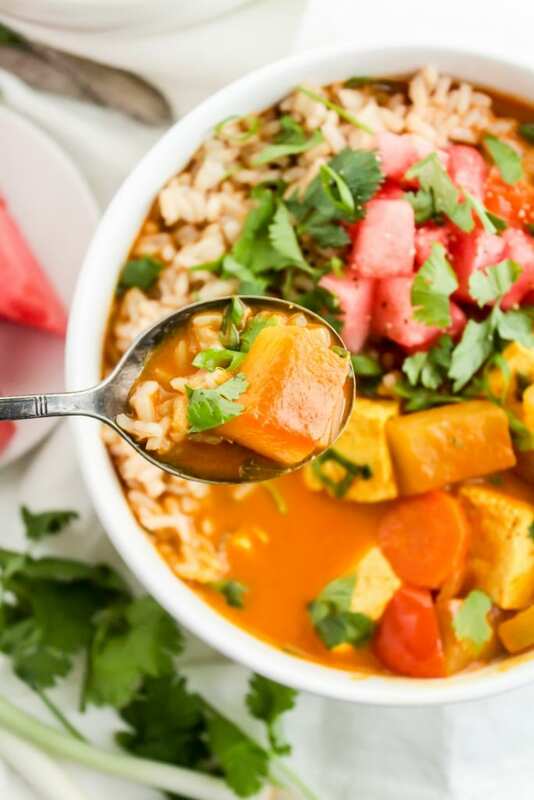 Now that the weather is officially frigid, I thought it was the perfect time to introduce a cozy new recipe to keep you warm: Watermelon Rind Curry. That’s right, you can cook with watermelon rind, and it makes for a fantastic (fANNEtastic!?) 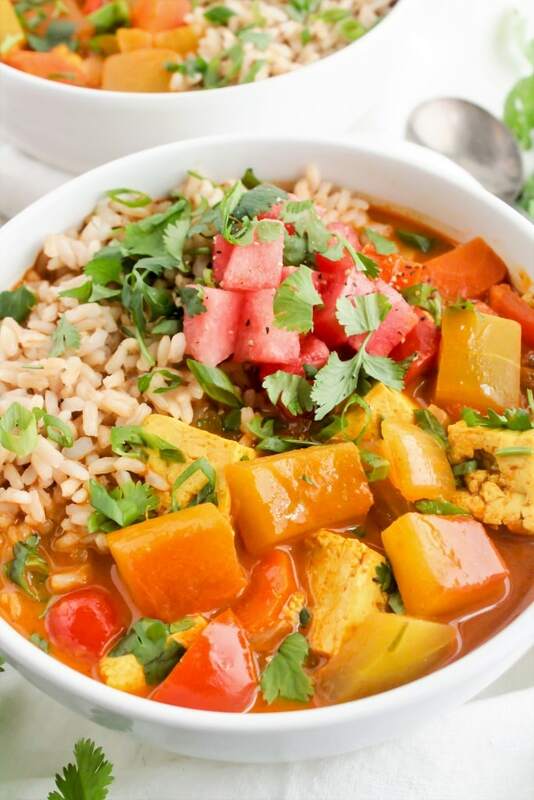 easy and nourishing curry dish! Thank you to my friends at the Watermelon Board for sponsoring this post. Using watermelon rind is a great way to cut back on food waste and make healthy recipes. Have you tried my Watermelon Rind Gazpacho or Watermelon Rind Coleslaw recipes yet? 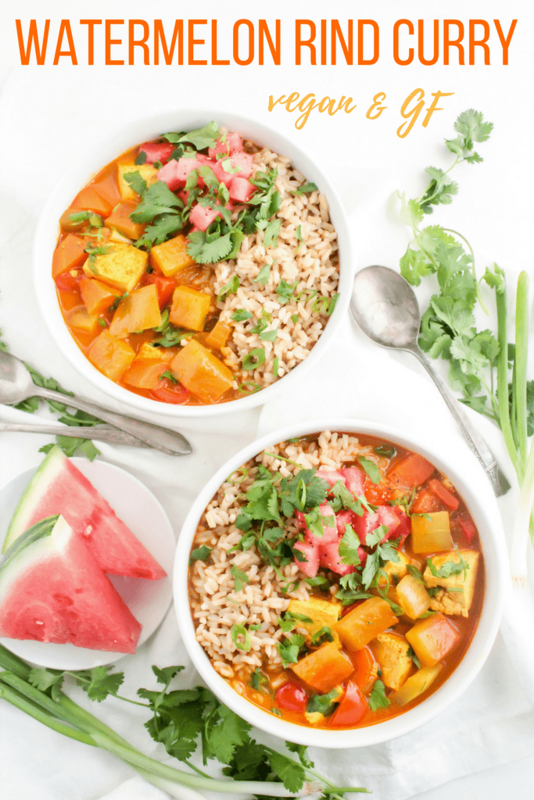 They’re delicious, but this time I wanted to switch things up a bit and cook watermelon rind into a hot dish to enjoy during the winter months. I kept this curry recipe quick, easy, and vegan with tofu as the protein component, but feel free to substitute diced chicken breast or shrimp if you’d like. If you’re apprehensive about cooked watermelon rind – don’t be! 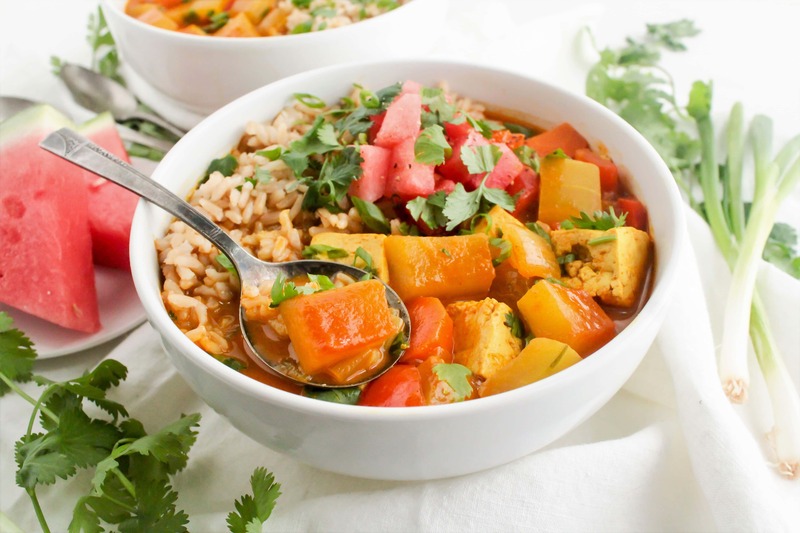 It soaks up all the delicious curry flavor from the sauce, and the texture is a bit like a less-starchy cooked butternut squash or turnip. Cooking with watermelon rind is great not only because it cuts back on the amount of food you throw away, but also because it’s chock full of nutrients! Watermelon rind is a great source of vitamin C, potassium, vitamin B-6, and citrulline (which is great for heart health!). All the more reason to use the rind instead of tossing it. This curry is on the table in about 30 minutes and is packed with produce, vegan protein, and tons of flavor. The curry paste I used wasn’t super spicy, so this was a pretty mild curry, but feel free to get as spicy as you’d like by using hotter curry paste or curry powder or adding in a bit of cayenne or sriracha. Heat a drizzle of olive oil in a large pot over medium-high heat. Add the onion, bell pepper, and carrot. Cook until softened, about 5-7 minutes. Add curry paste, turmeric, coriander, and cumin. Cook for 1-2 minutes, until fragrant. 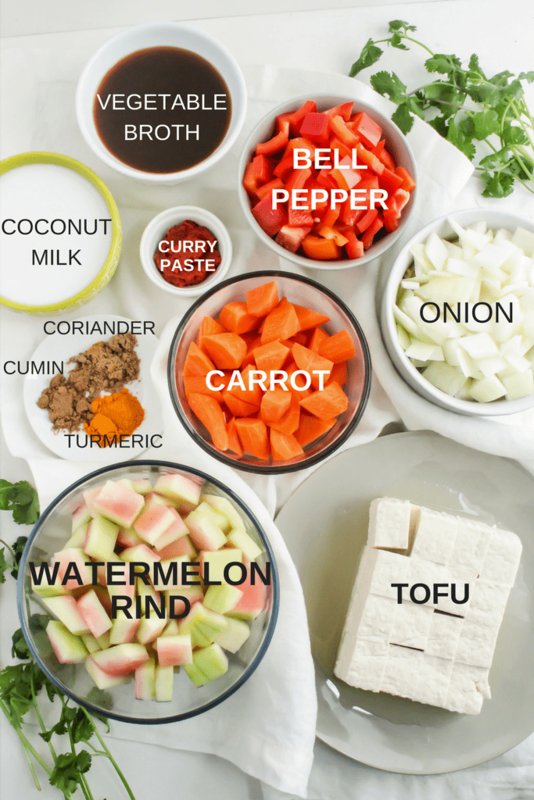 Add watermelon rind, tofu, coconut milk, and vegetable broth. Stir to combine. Bring mixture to a boil, then cover and reduce heat to low. Simmer until watermelon rind is tender, about 20 minutes. Serve over brown rice and garnish with chopped cilantro and green onion. Looking for more easy one-pot dinners? Here are some of my favorites! Have you ever cooked with watermelon rind before? What did you think? What’s your favorite cozy winter recipe? I’ve never ever cooked with watermelon rind! Such a creative use! 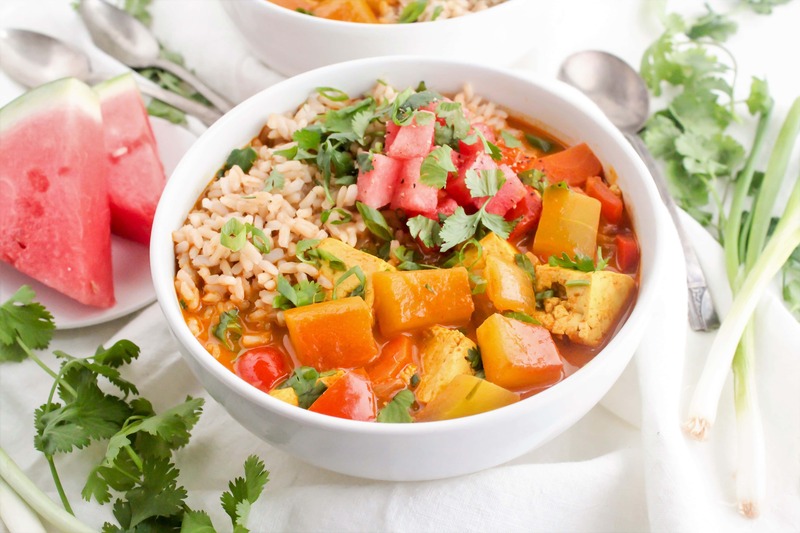 I have made a curry once using watermelon rind.That was kind of dry curry, and turned out good.And this is like , added more veggies and i think, this will be a perfect to have with rice.